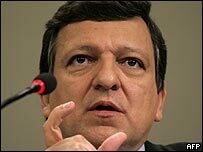 Jose Manuel Barroso has stepped into a row over a huge European energy deal by warning EU members against shutting markets to foreign competition. The European Commission president said economic barriers were damaging to the EU amid a continuing Franco-Italian dispute over protectionism. The merger of Gaz de France and Suez has brought simmering tensions over "economic nationalism" to the surface. Italian ministers have urged Brussels to block the 72bn euros deal. The deal would, in effect, give the French state control over one of Europe's largest energy firms. Italian ministers have alleged the deal is primarily motivated by a desire to keep the two businesses - one of which is an Italian takeover target - in French hands. Mr Barroso said he had been disturbed by the row over the merger, urging EU members to refrain from "nationalist rhetoric". "The suggestion is sometimes that member states are defending themselves against each other," he said. "We are not going to be able to meet the challenges facing us if we take a nationalist approach." Paris has strongly backed the deal, arguing it conforms with its policy of protecting businesses in areas vital to national security - such as energy, biotechnology and data security - from foreign takeover. Despite Mr Barroso's comments, the row over the deal has shown no sign of dying down. Henri de Castries, chief executive of Axa - France's biggest institutional investor - said the French government's policy of "economic patriotism" was tantamount to protectionism. He said France was guilty of double standards if it objected to foreign bids for its largest companies while encouraging French firms to expand overseas by buying other businesses. "States that systematically consider that their companies have the right to make hostile bids in other countries but no-one has the right to do the same to them risk paying a very high price for this in the coming years," he commented. Meanwhile, Italy's most senior banker was reported to have criticised France's policy of protecting certain businesses. "The French protectionist model is doomed to failure," Mario Draghi - governor of the Bank of Italy - was quoted as saying by the Italian newspaper Il Sole 24 Ore.
"Better to follow the examples from London and Berlin." Despite the furore over the deal, Brussels has said it will only launch an investigation if there is evidence it would breach EU competition rules.